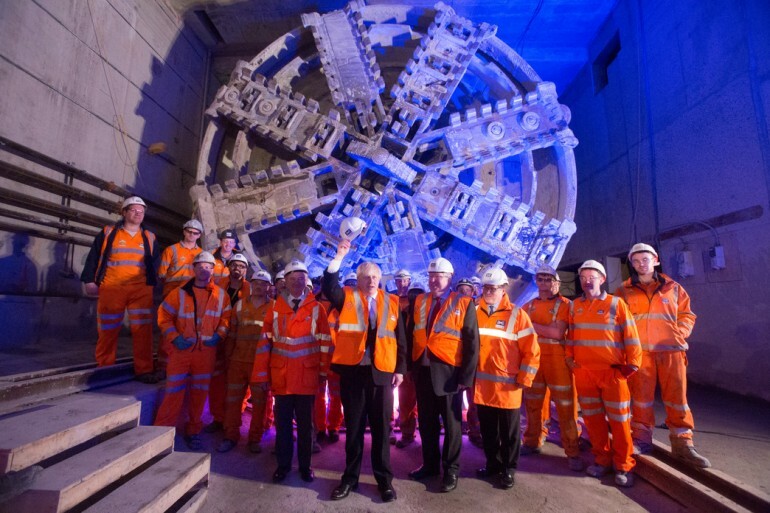 Last chance for public to nominate their ‘modern day heroes’ in TBM naming competition - Crossrail . For information about the Elizabeth line please visit the Transport for London website. What have Olympians, Paralympians, politicians, members of the Royal Family, actresses, pop stars and famous authors got in common? The answer is that they’re all among the names suggested by the public so far in the naming competition for Crossrail’s final two tunnelling machines. A total of eight Tunnel Boring Machines (TBMs) will be used to build 26 miles (42km) of tunnels beneath London to form the central section of the Crossrail route. An event last week gave a glimpse of the scale and power of the huge 1,000 tonne machines as TBM Elizabeth broke through into the new Canary Wharf station box, marking the biggest milestone in the Crossrail project so far. The tunnelling machine naming competition is open for people to nominate names at www.crossrail.co.uk/tbmnamingcomp, closing on Friday 7th June. A final shortlist of names will then be selected with Crossrail workers, including those who will work on the final two tunnelling machines, choosing two winning names from the shortlisted public nominations. The winning names will be etched onto the side of the two machines before they are launched on their tunnelling journey later this summer. The names of Crossrail’s first six TBMs were each inspired by British heritage and history – tunnelling machines Ada and Phyllis in west London named after early computer scientist Ada Lovelace and Phyllis Pearsall who created the London A-Z; Elizabeth and Victoria in east London, named after Queen Victoria and Queen Elizabeth II; and Mary and Sophia in southeast London, named after the wives of famous railway engineers Isambard Kingdom Brunel and Marc Isambard Brunel. For the final two tunnelling machines Crossrail is looking ahead to the modern day, asking the public to nominate their ‘modern day heroes’ and inspirational women. The final two tunnelling machines will be used in Crossrail’s tunnelling drive from Pudding Mill Lane, near Stratford in east London. The machines will tunnel beneath east London to Stepney Green, helping link the surface railway from Shenfield in Essex, through Stratford Station, into the central tunnelled section of the new Crossrail route. The two 150 metre long, 1,000 tonne tunnelling machines are currently being assembled on site at Pudding Mill Lane. The first machine is set to start tunnelling in the summer and the second machine will start in early 2014. The machines are expected to complete their tunnelling drive by summer 2014.